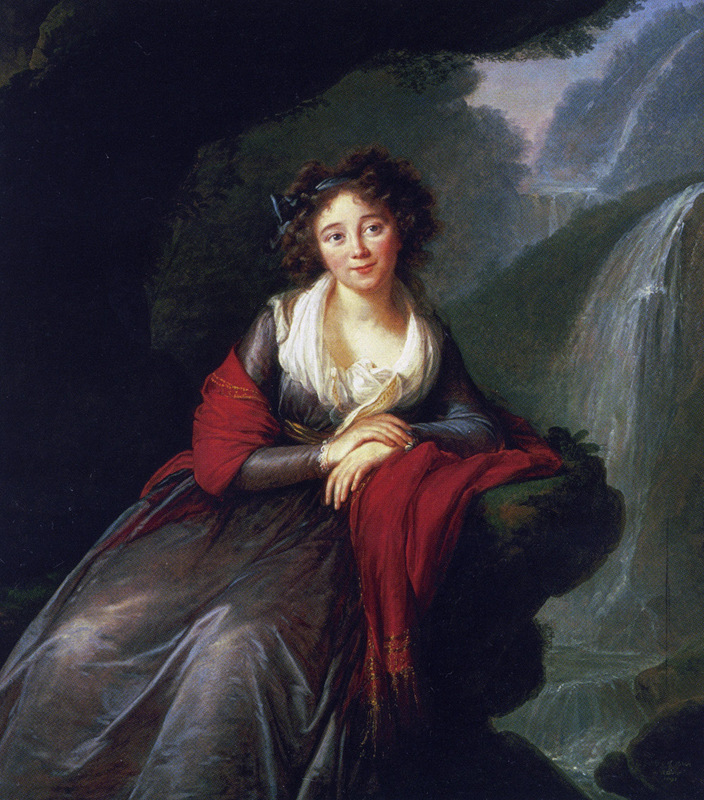 The Polish noblewoman, Anna Potocka (1758-1814), was residing in Rome when she posed for this portrait. Her maiden name was Cetner, and she was the only daughter of I. Cetner, a landholder, horticulturalist, and self-styled philosophe from the region of Galicia. On his estates of Krakowiec and Cetnerowka, her father doted on her, catering to her every whim. Anna's single claim to fame is the fact that in days when divorce was looked upon with horror, she almost made a practice of it. Her first husband was Prince Joseph Sanguszko, Grand-Marshal of Lithuania, by whom she had her only child, a son. Sanguszko was given to strong drink; his untimely death occurred from injuries he sustained in a fall during a hunting expedition. After a year's mourning at the Convent of the Holy Sacrament in Warsaw, the widowed and very wealthy Princess Sanguszka met a young general of the artillery, Prince Casimir Nestor Sapieha. A drunkard and a wastrel, the Prince married her for her fortune, and so she had few scruples about suing for divorce three years later. While awaiting the decree, she temporarily withdrew to the convent, and then returned to her father at Krakowiec. The divorce was granted, apparently with the sanction of Rome because she was able to marry a third time. Her next husband, Count Kajetan Potocki, loved her passionately, but she was unfaithful to him, and after six years their marriage was dissolved. Even her indulgent father tired of Anna's promiscuity. Nevertheless, he accompanied her to the altar a fourth time when in 1803, at the age of forty-five, she married in Vienna Charles Eugene, Prince de Lorraine (1751-1825). Her last husband, an Austrian Field Marshal closely related to the Hapsburgs, had fought in most of the allied campaigns against the French. Her adulterous behavior remained just as blatant, but the marriage survived until her death in 1814. Anna Cetner was the wife of Kajetan Potocki at the time the sittings for the present portrait took place. Since Prince Sanguszko had died in 1781, the artist's memory was in error when she wrote: "(Countess Potocka] came to my home with her husband, and as soon as he left, she told me with great composure: He is my third husband, but I think I shall take back the first [sic] who suits me better, even though he is a drunkard" (Souvenirs, II, 39). Though not a compelling character study, this work is a brilliant example of "poetic portraiture" (i.e., a portrait combined with a dramatic landscape), and offers a symphony of textures and colors. By a clever manipulation of light-reflective surfaces, the vividness of her palette, and fluid brushwork, the artist has reproduced the sitter's amber flesh tones, her curly auburn hair, the gold-fringed scarlet shawl, and the shimmering gray satin gown. Vigee Le Brun had aspirations as a landscape painter. Early in her career she had copied paintings by Joseph Vernet (see cat. no. 7). Though many of the portraits painted in France before the Revolution contain vistas of trees, shrubbery, and open sky (see cat. nos. 13, 16, and 24), in Italy she began to make serious attempts at painting landscape for its own sake, directly from nature. She sometimes integrated these into her portraits. For the most ambitious of these, that of Countess Potocka, she chose a romantically picturesque grotto, undoubtedly an evocation of the celebrated gardens of Tivoli. Behind the Countess, a hazy sunlit landscape of moss and ivy covered rocks, includes a series of waterfalls. Soon after her arrival in Rome, Vigee Le Brun made a sketching trip to Tivoli in the company of her friend Menageot and her husband's protege, the landscape painter Simon Clement Denis. Presumably she utilized the pastel drawings executed at this time in the composition of the Countess's portrait. "In the early morning," she wrote, "we returned to the cascades, where I finished my sketch. Then we went to see the grotto of Neptune from the height of which falls an enormous quantity of water which, after crashing onto the great black rocks below, forms a large sheet of sparkling clear water. From there, we entered what is called Neptune's Lair, which is nothing more than a cluster of moss-covered rocks upon which fall streams of water, making this cavern a very picturesque spot" (Souvenirs, 11, 66-67). An anonymous copy of the painting is in the National Museum, Wroclaw, Poland (illus. in Ryszkiewicz, cited below, p. 32, fig. 11) and a miniature by J. Bechon is signed and dated 1803(present location unknown). PROVENANCE: Collection of the sitter; by inheritance to Countess L6on Potocka, nee Golovine; to her daughter, Countess Andre Mniszech, Wisniowiec, Poland; to her son, Count Leon Mniszech; his sale, Paris, Galerie Georges Petit, April 9-11, 1902, lot 84 (as Portrait of Princesse Charles de Lorraine and only "attributed to" Vigee Le Brun); bought by Gardner; Count Karol Lanckoronski, Vienna; Newhouse Galleries, New York; acquired by Mr. and Mrs. Kay Kimbell 1952; Kimbell Art Museum since 1965. EXHIBITION: Fort Worth, Art Association, Twenty-One Paintings from the Kimbell Art Foundation, March 3-26, 1953, no. 20, illus. SELECTED REFERENCES: Souvenirs, 11, 39, 368; E. Rastawiecki, Slownik malarow polskicli, Warsaw, 1857, 1, p. 259; Nolhac, 1908, p. 94, illus. facing p.90; Heim, , pp. 111, 216; Hautecoeur, [19171, pp. 79-80; Blum, 1919, pp. 55, 100, 103; Mycielski and Wasylewski, 1927, pp. 26-28, 95-100, cat. pp. 4-5, no. 5, illus. facing p. 20; E. de Vaux, "Les Portraits polonais de Madam Vigee Le Brun," Le Monde Illtistre, August 25, 1928, p. 116; G. Larazzoni, "Le tariffe dei grandi retrattisti residenti a Roma nel secolo XVIII," L'Urbe, IV, No. 10, 1939, pp. 18-20; Z. Batowski, Malarki Stanislawa Augusta, Wroclaw, 1951, p. 53; Kimbell Art Museum, Catalogue of the Collection, Fort Worth, 1972, pp. 114-115, illus; K. R., "The Kimbell Art Museum, Fort Worth, Texas," Burlington Magazine, December 1972, pp. 891-892; Ryszkiewicz, 1979, pp. 30-32; Kimbell Art Museum, Handbook of the Collection, Fort Worth, 1981, p. 97, illus.